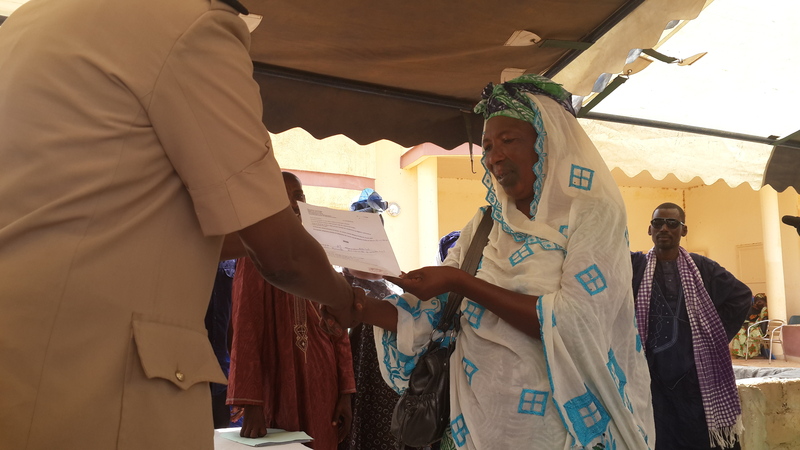 A Senegalese woman receives her land title. MCC and Senegal have worked together to help resolve complex land tenure issues that impede economic growth. Mballa, a village of just under 1,000 inhabitants in northern Senegal, began sometime in the distant past as a simple encampment frequented by nomadic Fulani herders and farmers. Its original permanent inhabitants were primarily from the Sowonabé group of Fulani, whose members held the status of “nobles” while other ethnic groups served them as laborers. These populations have co-existed as separate communities for many decades with geographical segregation and self-imposed restrictions on inter-marriage. From the early 2000s, significant population growth resulted in shifts in the demographic landscape. The area occupied by the non-noble descendants—previously an undefined site of land on the outskirts of the village, Sowonabé Botol—had grown so quickly that it officially became its own village, Mballa, in 2011. This event increased the social status and influence of the people of Mballa among local villages, but it also exacerbated the social divisions between them and the locality’s historically noble population. This history also plays a role in hindering economic opportunities: While the descendants of the original Sowonabé of the area maintain their ancestral status as landowners, the people of Mballa remain largely landless with limited prospects for gaining formal land property rights. The Millennium Challenge Corporation and Senegal are working together to address these complex land tenure issues that impede economic potential in Mballa and elsewhere. The five-year, $540 million compact includes a project to improve agricultural productivity in the Senegal River Valley, the country’s rice production heartland, by improving the performance of the irrigation systems in the Delta valley and Ngalenka perimeter. The Ngalenka project, located near the village of Mballa, aims to increase agricultural production by constructing a new 1,087-acre irrigated perimeter. The land tenure security activity was designed to accompany the irrigation investment by ensuring land tenure security and mitigating the risk of land conflict due to increased value of irrigated areas. Through improved and more transparent land allocation, increased formalized land rights and enhanced local land management capacity, compact beneficiaries play an active role in determining their land rights in a transparent manner that ensures fairness now and into the future. The initiative to improve land allocation procedures began in 2011 in nine municipalities in the Senegal River Valley, including the Ngalenka perimeter. The land allocation criteria that resulted were the product of participatory workshops that featured input from various stakeholder groups, including farmers, herders, women, and youth. The approach blended traditional and modern land practices and worked with the Senegalese government to improve local land governance. The beneficiaries of the final land allocation distribution of the 1,087-acre Ngalenka perimeter reside in 23 different villages, including Mballa. The negotiated allocation formula reserves land for customary holders of land rights based on the area’s dominant lineages, in addition to formerly landless populations, people resettled by the project and women organized into producer groups. Women are also eligible to receive land as individual members of the different lineages and land allocation categories. Given the increased production potential of the newly irrigated perimeter, these proportions are designed both to provide for existing land rights and to increase access to land for underserved populations. Now that the land allocation and property rights distribution process has been completed, the previously landless families of Mballa own about 50 acres of land, with an additional 8.5 acres reserved for the women’s producer groups of the village. This level of access to land and accompanying property rights are unprecedented in the history of Mballa—but, according to Mballa’s inhabitants, this is only a beginning.